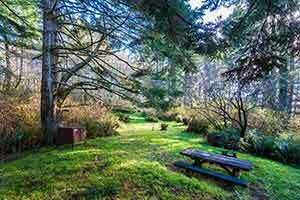 This loop explores most of Mill Creek Campground’s unusually extensive trail system, a set of loop trails on a steep hillside of second-growth redwoods. As second-growth redwood hikes go, this one is quite scenic, passing through a variety of exceptionally lush environments. Most of the trail is very quiet, with little traffic noise and few visitors. 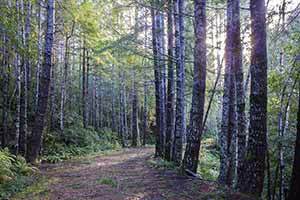 If you’re staying at the campground and don’t mind a little driving, I’d highly suggest hiking some of the nearby old growth trails before considering the campground trails. 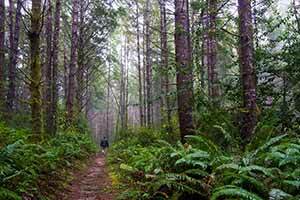 Just a five minute drive south, for example, the Damnation Creek Trail and the DeMartin Section of the Coastal Trail both have extensive old-growth. 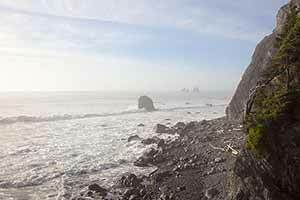 15 minutes to the north are the even more scenic, world-class trails of Jedediah Smith. During the summer, non-campers who want to hike here can park in a small parking area near the entrance kiosk, for which the park charges a fee. From October 1st to April 30th the campground’s main gate is locked, meaning that you have to park by the highway. 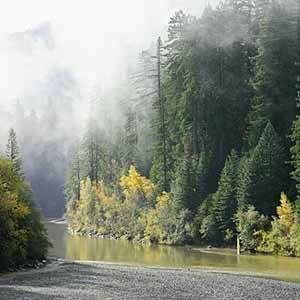 Although the park website says that it’s OK to park by the highway during this time, the only places to park are on the narrow paved shoulder of the highway, where your car will probably be rear-ended, or in a muddy verge to the right of the gate, where your car will probably become stuck in the mud. Ironically, by far the best time to hike these trails is in winter, when no one is around to enjoy them. The foliage is a strikingly rich green, lots of little creeks flow alongside the trails, and the area is remarkably quiet. In summer the woods tend to look more monotonous. Here’s the winter trailhead location in Google Maps and Google Street View. 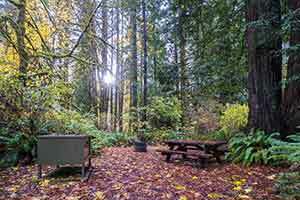 This description starts at the winter trailhead location, at the top of the Mill Creek Campground Road. Start on the part of the Hobbs Wall Trail north of the access road. This is one of the best parts of the hike; it’s cut into a steep hillside, and the dramatic terrain makes the trek more interesting. From the access road, the trail descends steeply through a lush, densely-wooded ravine alongside, in winter, a little creek. At first quite a few redwood stumps are visible; most are small but there are a few huge ones. 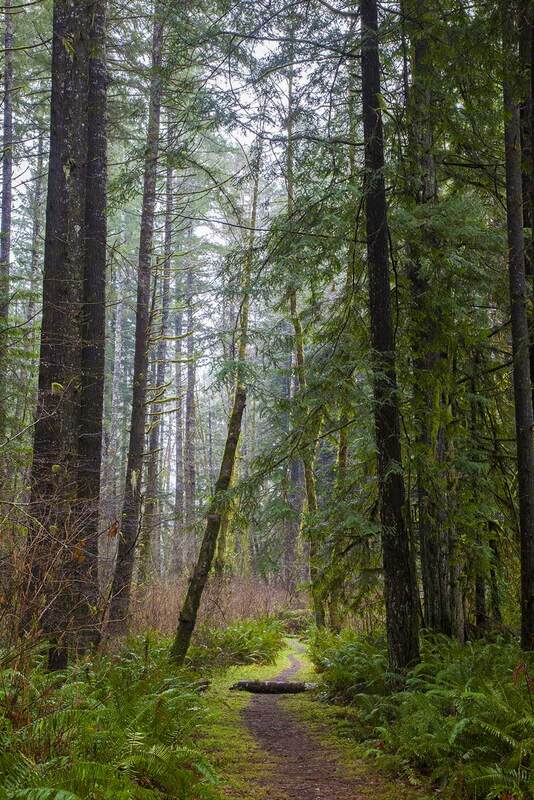 As the trail descends into a mixed Douglas-Fir forest the stumps become less common. 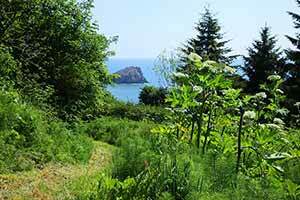 The ferns and foliage in this area are a strikingly intense shade of green. The trail levels out and meanders through more ravines. Cut into the side of a hill, the trail offers a few brief glimpses through the trees of the hills of the Mill Creek Watershed. The trail climbs to an intersection with the Saddler Skyline Trail. To the right, it climbs to reach the campground access road just downhill of the entrace kiosk. Straight ahead, the trail continues its descent, crossing the access road. 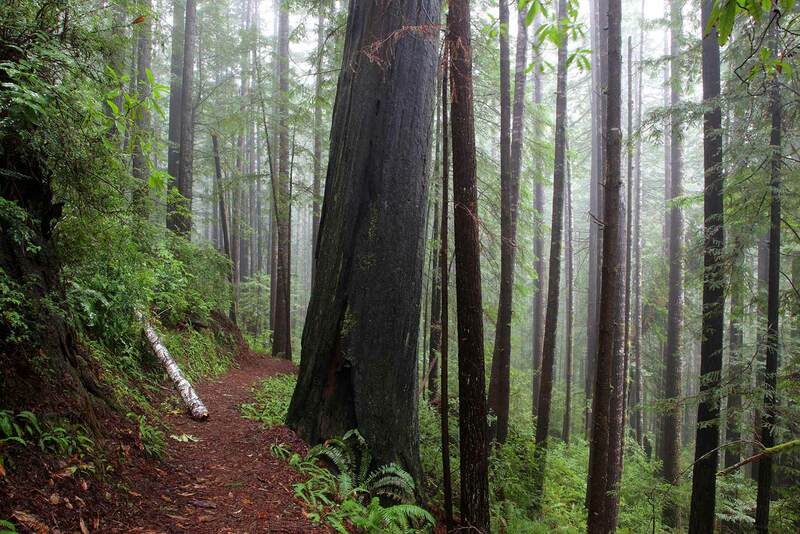 The Alder Basin Trail climbs steeply into the lush second-growth redwoods behind the campground. The trail winds through some small ravines for what seems a surprisingly long time (given how short it looks on the map) before making a steep descent back to the campground. The first half-mile of the Trestle Loop is refreshingly flat. 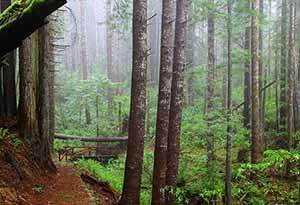 The trail is especially enjoyable because it’s close to Mill Creek, offering a change of scenery from the rest of the campground trails. It runs through the scrub alongside the creek for a ways before entering a dark, attractive fir grove. 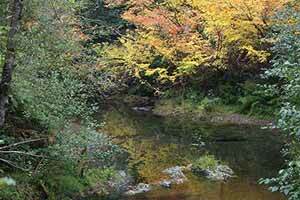 It then crosses Mill Creek; in winter there’s no bridge and you have to wade through the 18 inch deep, fast-flowing creek. In summer the creek is dry and you can just walk across. There’s supposedly an old railroad trestle somewhere around here, but I’ve never seen it. Past the creek, the trail is not as well maintained, and it begins to climb again. 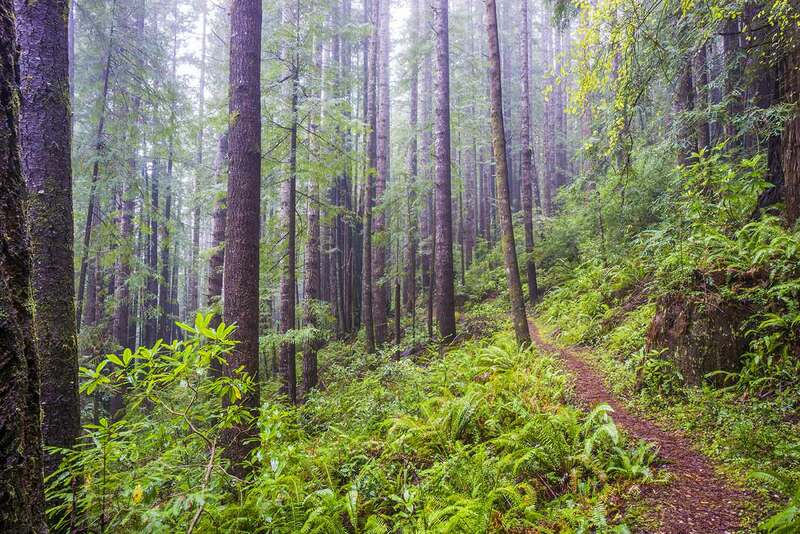 Turn left onto the Saddler Skyline Trail, which passes through a broad, brush-filled ravine, then ascends through the same ravine through lush second-growth redwoods. The way the trail meanders through the dense woods makes this one of the more interesting parts of the hike. The ravine gives way to an ordinary and less-interesting hillside. The lush groundcover of ferns is replaced with huckleberry bushes. The trail climbs steeply up the hill by way of a lot of small switchbacks, then descends to an intersection with the Nature Trail. The Nature Trail has a lot of stands for interpretive signs, but most of them are empty. The trail curves past the campground entrance kiosk; at the next trail intersection, turn left onto the Hobbs Wall Trail. 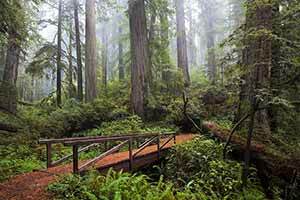 The trail climbs through redwood and fir groves nearly to Highway 101, then starts to descend as it runs parallel to the highway. At one point you can see a wall consisting of the ends of redwood trunks to your left; the highway at this point is literally a redwood highway, built on a fill of redwood trunks that spans a small depression. Immediately after this point, the trail enters an old-growth area. 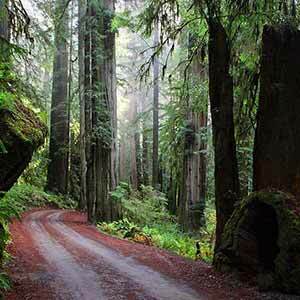 The old growth is a very narrow strip that runs along the ridgetop just a few feet from the highway, but it has some immense trees. Ridgetop old growth groves such as this were rarely preserved, but can be quite scenic. 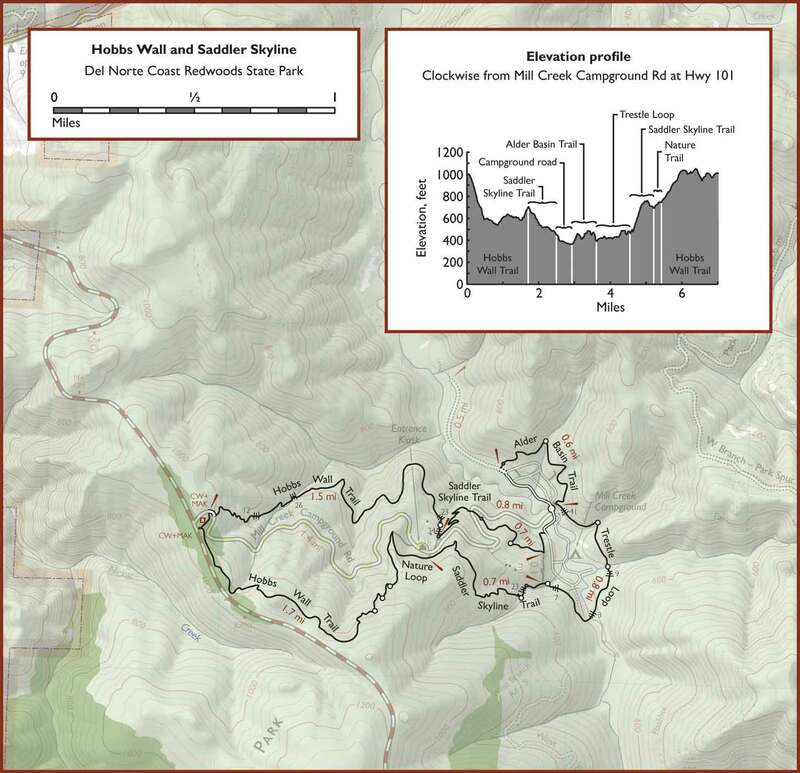 A Daily Triplicate article describes this hike. 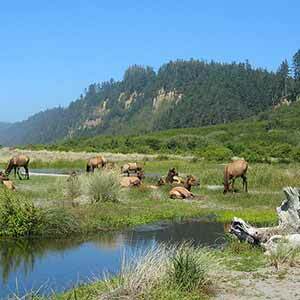 Dan Brett’s book, Hiking the Redwood Coast, has a chapter on this hike (without the Alder Basin Trail). 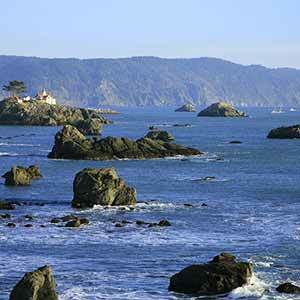 A similar chapter appears in the same author’s book Best Easy Day Hikes/Redwood National and State Parks. 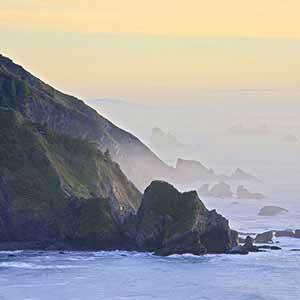 Jerry and Gisela Rohde’s book, Best Short Hikes in Redwood National and State Parks, includes a chapter on the lower half of this hike.